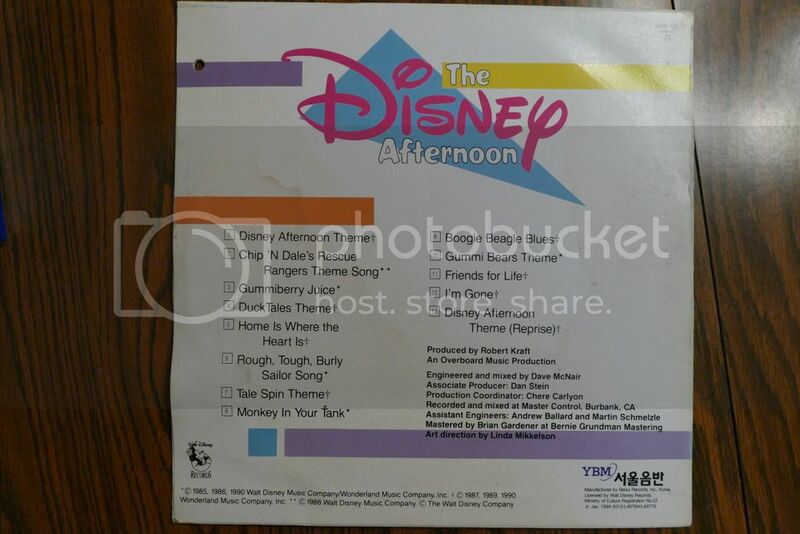 The Korean Disney Afternoon LP Treasure Hunt! 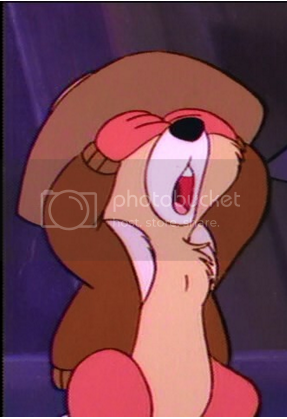 When I first rediscovered the Rescue Rangers I got the CD version of the Disney Afternoon soundtrack. I then learned that it was also released on vinyl but it was very rare as it was only located in South Korea. It’s so rare, in fact, that I’ve never seen an image of it save for closeups of the record label. I had searched off and on for nearly a year and found absolutely nothing more about it, let alone actually locating a copy. 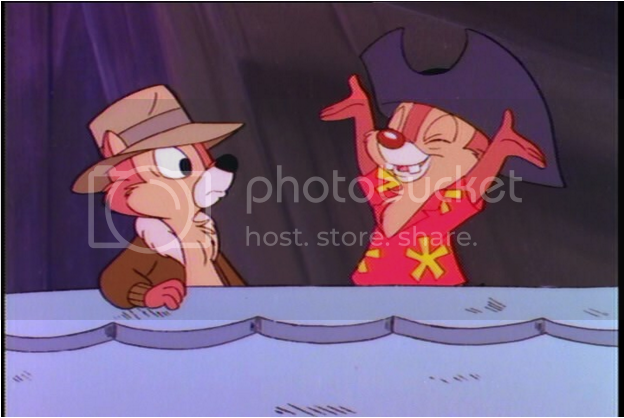 The Disney Afternoon soundtrack is very precious to me. The opening theme is a tremendously powerful song as I have a very strong positive association with it. 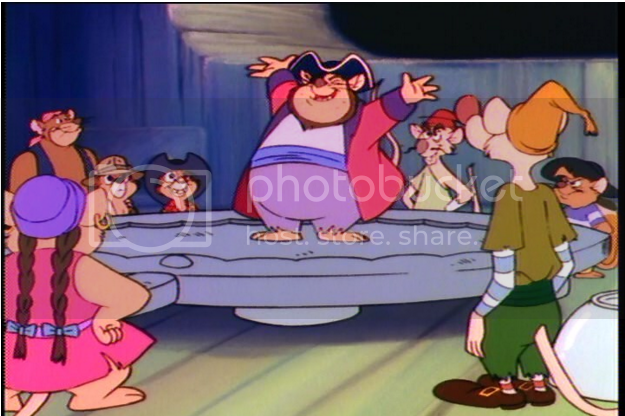 I had been bullied very badly as a child and had repressed any memories associated with it including the Disney Afternoon and CDRR in particular, as the Rangers were my friends and they were there for me each day when I got home from school. My brother and I would get home, grab our snacks, spread out a blanket on the floor and get the TV on and warmed up in time so we wouldn’t miss one second of the opening theme, a theme that signaled the start of a precious respite for me. Step right up and come on in...here’s where the fun begins! When I listened to the DA theme for the first time since childhood in late 2014, I just started crying as all of the memories started coming back to me. I can’t describe how much it means to me. No matter how bad my day is even as an adult, the theme makes me so very happy every time I listen to it. My heart swells with joy and it lifts my spirits. It inspires me. It became my mission to track this down as I wanted to listen to it in the highest quality possible. Now for the most important question: is this an AAA release? What’s that, you say? What does that mean? Well, silly goose, I’ll tell you! The first letter indicates the recording source. The second indicates mixing and the third indicates the mastering. 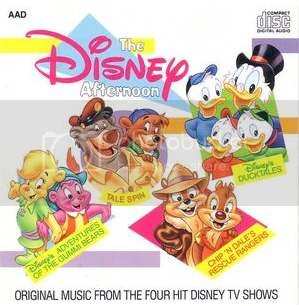 The Disney Afternoon soundtrack came out in 1990. 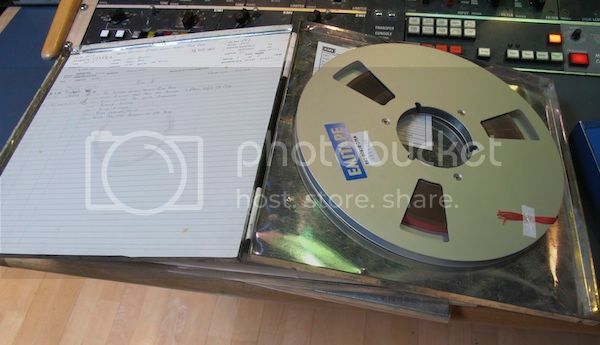 That was the tail end of the analog era and recording studios would still record to analog tape. The wider the tape and faster the recording speed, the better the sound quality. By “analog tape” I’m not referring to little 1/8” wide cassettes here that move tape at a measly 1 ⅞ inches per second (IPS). I’m talking multi-track 1” to 2” wide tapes that go at 15 or 30 IPS- the absolute gold standard of recording quality and has not been beaten by any digital recording system to date. A professional Ampex reel to reel tape recorder circa 1980. How was the Disney Afternoon CD made? What SPARS code would it have? As good as the CD is, the full quality of the master tape can only be heard at home with a vinyl pressing as a compact disc is a limited fidelity playback format by comparison. The best way to most completely capture the original performance is AAA: analog tape recording, analog tape mixing, and a vinyl record for playback. How is a record made? How do the recording and mixing steps impact the record’s sound quality? A vinyl record is a high fidelity playback system, but it is only as good as its source. Each part of the signal chain along the way must be kept at a high quality in order for the home listener to hear something that does justice to what the songs sounded like when they were played live. How do records get made? Watch this video and find out! It’s a fascinating process and yields impressive results. This video uses a digital mix instead of analog tape, but you get the idea. If you want to see the entire process in great detail from the live recording to the final record playback, take a look at this vintage 1956 RCA Victor documentary. This is an all-analog process (AAA). While the equipment got more advanced over time, the process is essentially unchanged today and records from even the 1950s can produce gorgeous sound. The LP (long playing record) and the microgroove stylus was invented in this era. 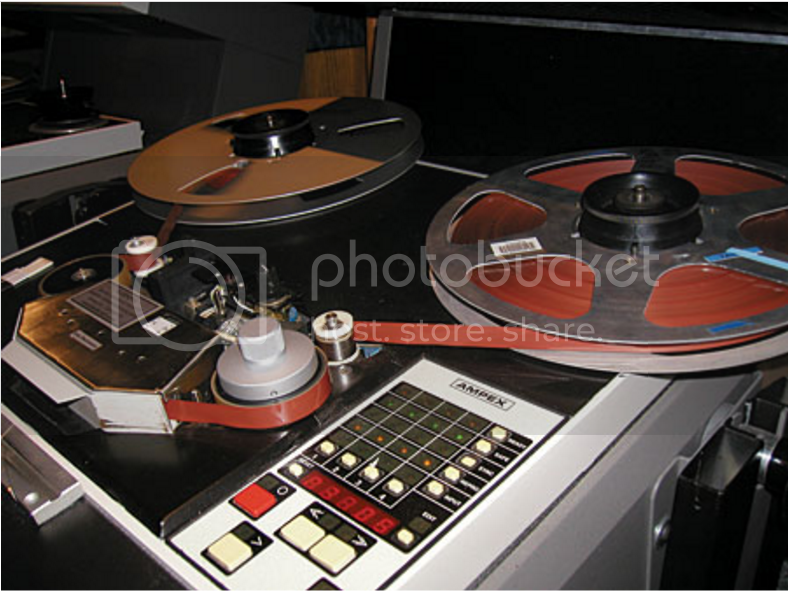 Magnetic reel to reel tape was widely used for recording for the first time. This transformed the humble phonograph disc from a hissy, crackly facsimile of a performance to a wonder of engineering and high fidelity. These are some of the greatest inventions ever created in my opinion and leaves me in awe. I am forever grateful to the scientists, engineers, recording technicians, and everyone involved who worked for years to create and perfect them. Their work lives on and hasn’t been beaten yet. 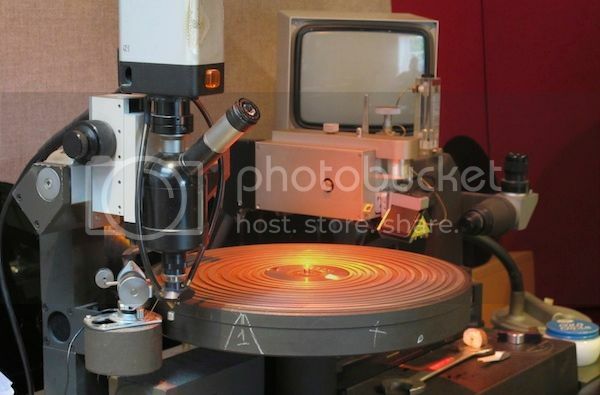 To make records, we need to transfer information from a magnetic storage medium (tape) to a mechanical one (i.e. grooves in a record). You literally take the audio signal and feed it to a cutting head on a lathe that looks much like a turntable needle, but it translates the audio signal into a mechanical vibration that cuts into a metal disc with lacquer coated on it, often simply called a “lacquer.” The lacquer then goes through a series of electroplating steps before it turns into a stamper that forms melted biscuits of vinyl into a record. If that signal that the cutting head uses is a high quality analog one (preferably the original analog master tapes but is usually a safety copy), the sound will be spectacular. If it’s digital, the experience will be compromised significantly. Here is a video of a very well known recording engineer explaining his methodology and actually cutting a lacquer. Ironically, Bernie Grundman's studio made the lacquers for this album, too! Having the lathe use a digital mix to cut a lacquer can only result in three codes: ADA, DAA, and DDA. You can get vinyl editions of modern music, but it is recorded and mixed digitally, hence the DDA code. This doesn’t sound anywhere as good as a genuine AAA release. Each part of the chain from recording to playback must be kept at a high quality in order for the listener to get the full experience. For various reasons that I will not get into here, a vinyl release of modern music will still sound better than the CD release of the same song, even though the entire signal chain up to this point is essentially CD quality. DAA would be much the same as the source quality isn’t as good as a tape recording and wouldn’t be helped with analog mixing. What is very frustrating is the ADA release. The recent remastered stereo LPs of the Beatles albums, for example, underwent a ADA process: the original stereo tapes were transferred to 48/24 digital PCM for mixing and cleanup and then that digital mix was used to cut the lacquer. It had a grainy, flat sound. It wasn’t anywhere close to the original pressings. Serious record fans will often avoid these and insist on AAA releases: analog all the way. The studio listened to the fans regarding the digitization of the Beatles stereo mixes. For the mono mixes, the lathe was fed directly with the original analog master tapes! All was well with the world again. What about an audio cassette? Isn’t that AAA? You are correct! When I heard the Disney Afternoon cassette, it had a bit of that airy, room filling feel that you can get with analog releases. Some cassettes can sound amazing. (The CD still held its own by comparison and I deem it to be a superior experience overall. Cassette tapes vary wildly in quality so this is not unheard of.) While this was clearly AAA, a cassette can’t hold a candle to a record. Let’s keep the signal chain at top quality from start to finish. Not all ‘A’s’ are equal. You really hate the letter ‘D’. Does all digital stink? No. CDs pale in comparison to records and especially analog tape (and the less said about MP3, the better…) but high fidelity digital options like 192/24 PCM and 2.8 MHz/1-bit DSD recording and playback are out there and can sound great. DSD in particular is stunning (it was invented for the Super Audio CD (SACD) format) and can rival vinyl playback at times. It can also feature multi channel surround sound mixes that are like the short lived CD4 quadraphonic record concept. It’s that good. While I still prefer vinyl overall, I’d welcome an SACD release of the Disney Afternoon soundtrack. Unfortunately these high quality digital options aren’t being used so we’re still stuck in the 1970s with CD quality. Singhcr, you’ve been talking for hours now. Weren’t you on a treasure hunt? Oh yeah... that happens to me sometimes. Can’t blame a canine engineer for being passionate, can ya? Enough tech talk for now. Let’s find that record! Okay, guys.. let’s go on a treasure hunt! Thanks to some legwork by a former college classmate of mine who lives in Seoul, I finally tracked down a copy. The first time he sent me one, it came to me broken in half. Seeing my precious music and dreams shattered like that was heartbreaking. I wasn't sure if he could find another copy, but he personally traveled to the same record shop, inspected and played two copies, hand carried them to avoid the mail, and had them professionally packed. The records were packed very well and I had two of them just in case I damaged my primary copy. They are in pristine condition. The long hunt was over, despite the initial setback where I thought I'd come back empty handed. I found the treasure! The artwork is absolutely gorgeous and is another advantage of a vinyl release. 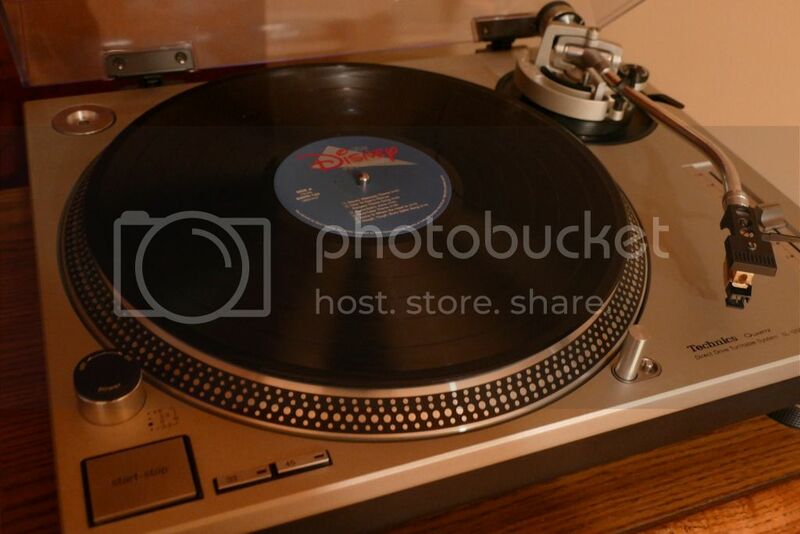 The album on my Technics SL-1200MK2 turntable. Now for the most important question: how does it sound? The LP came out in 1994. That is dangerously recent! Is it AAA or a vinyl copy of the CD master (ADA)? Let’s give it a listen. It is, without question, AAA. The sound is absolutely gorgeous. Some tracks like the Tail Spin theme and Monkey In Your Tank are honestly reference recordings in my mind. The room filled with a wall of sound and I was washed over with music that revealed every little detail. Home Is Where the Heart Is, already one of my favorite and most inspirational songs ever, was all the more beautiful on LP. I had my mouth open at times, shaking my head at how much of an improvement this was over the already stellar CD. Overall I was very impressed and honestly overwhelmed by how much I enjoyed the experience. 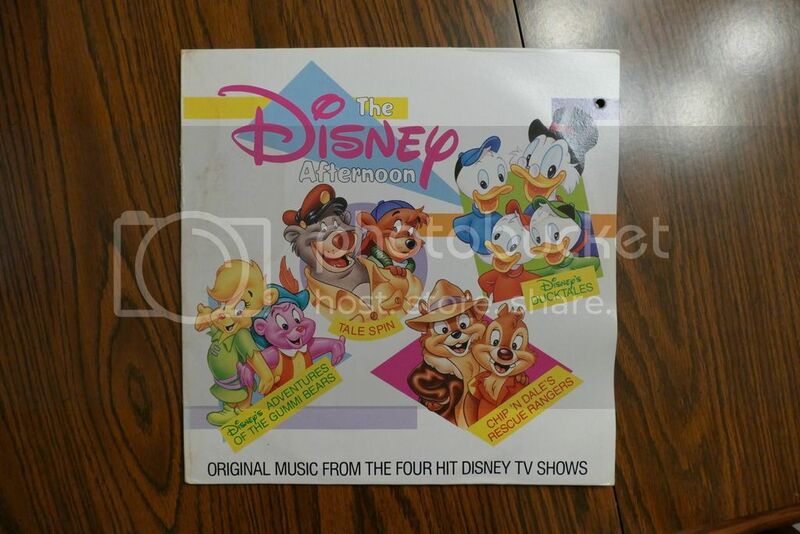 The Disney Afternoon LP is, bar none, the highest fidelity recording of my favorite songs unless I somehow manage to get the master tape on my hands. I have to thank the Korean Ministry of Culture for selecting this for their archives! Not only does the record contain the high frequency information on the master tapes that was lost on the CD, but it also does not suffer from the limitations of 16 bit sample depths (literally the number of discrete volume steps you can have in a sample of music). The Nyquist theorem is usually brought up at this point to show that the CD standard is “perfect”, but that assumes a perfect analog to digital converter with infinite sampling depth, a perfect brick wall low pass filter, etc. This doesn’t exist in reality. I am also dubious of the claim that the human body cannot process high frequency sounds above 22 KHz. If you go listen to a church organ you can't hear the very low frequency bass, for example, but you can sure feel it. Tape uses a varying magnetic charge to store its information, and that’s an incredibly sensitive recording process. But waveform analyses and mathematics aside, the true test is that of one’s ears and AAA audio is something that has unparalleled sound quality in my experience. I used to be a CD advocate until I heard an AAA record for the first time, and there’s a reason why it still has a devoted fan base: it simply sounds better and the musical experience is so much more enjoyable. There are also consumer two track reel to reel tapes to try, too. Even the humble audio cassette can wow me now and then. In the world of music, analog still reigns supreme. This is an absolute gem in my collection and not just because it’s very rare. It’s a very personal, moving, and uplifting experience for me and my heart goes out to all involved from the musicians to the recording engineers to the people at the pressing plant for all of their passion, energy and attention to detail. It’s truly appreciated and brings me great joy every time I play it. The instrumental version of the theme is also very moving and is a perfect way to cap off the album. Can't you feel the buzz? I can definitely feel the buzz. Until next time, folks. Time to dim the lights, close my eyes, and let the record do its magic. This wolf is in audio bliss right now. I shed tears listening to it for the first time, but they were not of sadness, but of joy. This is really fascinating. I never would have thought achieving high-quality audio was so complicated...and it's rather disappointing to learn that modern CDs suffer a huge loss of quality. I am very thankful for my friend Seongtae. Without him I never would have found this. Even if I could read Korean, Korean shops typically do not ship internationally for whatever reason. I am quite honored by all the work he did for me, and on top of that he refused to accept any payment, saying it was a gift. What a nice guy! To add to your disappointment, MP3 and almost all streaming audio is markedly worse than CD. For a comparison, a CD is approximately 1.4 MB/s whereas a "high quality" MP3 is 320 kbps. There is such a thing as high quality digital audio and it's been widely available for nearly 20 years but studios simply don't release music in that quality, let alone record at that quality either. Most DDA records are off CD quality masters, and modern recording/mixing techniques are quite lacking with almost zero dynamic range. In other words, the songs are at near maximum volume and stay that way throughout. It makes the music sound boring and when you turn it down a bit to get to a comfortable listening level it sounds very tinny and flat. Sampling rock music in the 2000s and beyond is rather disappointing in terms of the mixing and recording quality. Even stuff from the 1990s is mixed way better, even if it was recorded digitally. A major album from the 1970s sounds way better than anything done today, especially if you are listening to the LP. Comparing a CD to an AAA LP is sad enough, but going from an MP3 to an LP is downright frustrating. Very sad indeed.